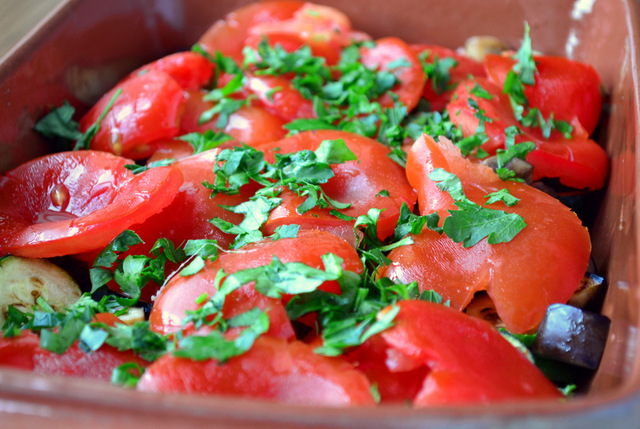 The difference between a mediocre Ratatouille and an exceptional one is its consistency. When making this classic French dish, it is important to keep the chunks of vegetable (or rather, fruit) intact. Ratatouille doesn’t require as much cooking as some appear to believe, but it does take time to perfect it. Spend your time wisely in the preparation and an exceptional ratatouille will almost certainly follow, boil it or stew it and your guests can expect to receive soggy, limp and unimpressive ingredients – no matter how good they taste. Despite it being one of my less favoured fruits, the aubergine (eggplant) is managing to barge its way into my diet, onto my blog and into your hearts. My recipe for Baba Ghanoush has succeeded in convincing me that there are ways to enjoy even one’s most detested food. I offer my previous post as a case in point; I thoroughly dislike parsnips, but have found that when added to a soup they work awfully well. Such a revelation can only serve to assist my frugality, since I am now far more willing to prepare ingredients that my mouth had never before entertained. One must remember that to be truly seasonal, it is necessary to embrace all avenues of food. As you probably know, almost all of the recipes that feature on this blog are my own. However, I often partake in a little research in order to ascertain the best method by which to make each dish. Though our methods don’t match exactly, Julia Child’s book ‘Mastering the Art of French Cooking’ provided good advice that I simply had to mention it. Julia’s book appears to be such a good reference for French cooking – I admire its authenticity. However, as a result of it being a genuine French cook book everything requires butter – an addition I don’t always agree with. Still, if you are a fan of excessive decadence in French cooking, this is a purchase to be made. 1. 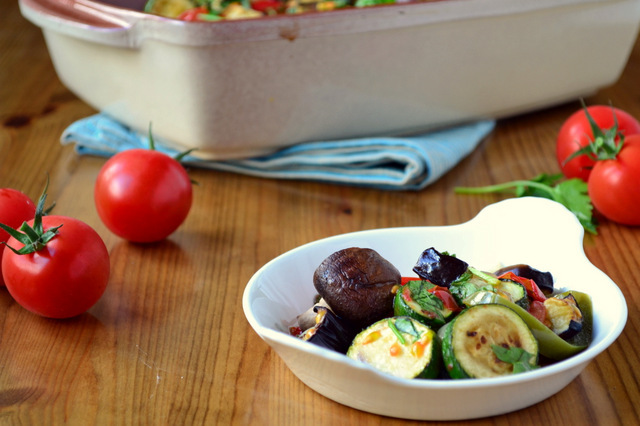 Pop your courgettes and aubergine into a large bowl and coat with salt, leave to stand for 30 minutes. Meanwhile, slowly cook your pepper, onion and garlic in a generous glug of olive oil – don’t let them brown. Fry off the mushrooms to remove any excess water they may contain. 2. Dry off the courgettes and aubergine using paper towels and brown them in a frying pan. Put the onions and pepper in a casserole dish, add half the courgettes and aubergine and all of the mushrooms to the top. Slice the tomatoes in half, remove the seeds and squish so they can be layered. Sprinkle over a little parsley. 3. Layer on the rest of the courgettes and aubergine, followed by a little more parsley. Pop in the oven at 180C for 20 minutes – serve immediately with bread or pasta. Cost: We got the vegetables at an incredibly reasonable price, but even if you don’t find them reduced they aren’t particularly expensive. This dish can be enjoyed as a meal, or as a side for as little as £3.60! Looks like a great side dish! Nice pictures! Thanks! It’s great with a little pasta for a main too. That looks amazing. We’ve been on an eggplant kick lately. They look gorgeous at the store. We need to try this! Yum! Love all that color too. Thanks! I love colour in food. That is the most beautiful food I have ever seen. Oh my gosh. That looks SO tasty. What a great way to sub veggies for a warm dinner. Savory almost. We’re gonna have that for dinner tomorrow. Thanks! Hehe – thanks :). It was great. I hope you like! Yes! Go properly frugal :D. Try not to beat me at my own game though! As soon as I have my very own garden I’m filling it with fruit and veg. Thanks so much – it all sounds rather idyllic! You’re making me green! Idyllic is something that the sell on the side of air freshner spray. It doesn’t exist ;). Idyllic is being happy in your bones and being content with your lot. Remember where all the best comedy in the world comes from and you are right smack bang in the middle of the hub of civilisation (well to the yanks and us anyway 😉 ). I didn’t go to Bristol when we went to the UK back in 2006. we went north to Liverpool and south to South End on Sea and then on to London that I was most taken with. I kept looking up at the amazing buildings and scaring the natives…they thought that the pigeons were coming ;). The only thing that I really wish we had done when we went to the UK was go to the fantastic gardens over there. I could have cared less about them back then and have only grown into gardens in the last few years. We have plenty of disgusting things on our feet at any given time. Part and parcel of having guerilla chooks (chickens) and ducks free ranging everywhere ;). Ahha – Essex is marginally better than Liverpool 😀 – of course it depends where in each area! You’ll see them eventually, I’m sure! The vegetables layered look so succulent, so delicious! It is like a garden of glory. A healthy glory! Oh my gosh, I totally agree! I’ve had my share of overcooked, soggy ratatouille. Yours looks as if it the veggies still have a nice bit of bite to them. Beautiful. Not too much bite, but a little bit of body! It need never be soggy again! This looks so gorgeous and delicious! I’m saving this to try soon! I have such a hard time getting my kids to eat vegetables. I may give this one a try. I’m not a fan of eggplant either, but this dish looks amazing! Thanks! It was totally delicious. Great pictures. Looks delicious. I must confess, I do it by the stew method, which does taste great but is not photogenic. Thanks! Tut, but then if it works for you there’s no point changing it. I know I’ve said this before, but I am loving the newly enthusiastic and colourful photography since you got your new camera – these photos really are splendid! Thanks, Juls! I’m getting to grips with it more and more! PS I see you have a new camera – as I desperately need to buy a decent one do you mind if I ask you what you have bought? Your photos look great. Well… I got it quite a while ago 😀 – but yes, I got a Nikon D3100 – it’s an entry level DSLR but does a great job! Thanks, I was actually looking at that one as it isn’t as ridiculously expensive as some (on a budget here)! No problem – you do that via the widgets in your dashboard! Wow! Very impressive. Looks delicious! Thanks so much 🙂 – this was delicious. I love eggplants, always have. And I’m also a big fan of ratatouille, because it is a lot of fun to say (oh admit it), and because it’s such a yummy side. But never tried to make it. Now I don’t have an excuse with such easy instructions. And Mr Frugal, if I may ask (super politely) have you ever considered make a recipe index? I often come here for my dinner inspiration (though never blog about what I make – why?) and a recipe index would be super handy for me 🙂 and it is all about me…. There is one already in the pipeline! You’re easily pleased aren’t you, Aimee? Haha – only kidding! You have to make some – thems my orders! Delicious! Your photography is superb – what camera do you use? I love eggplant, it’s so versatile! I wonder if you tried the thinner ones (sometimes called Japanese or Asian eggplants here in the US) you might like them more? I find them to be less bitter and they’ve got fewer seeds. I’m afraid I haven’t and I don’t think they sell them here either. I’ll keep a lookout though! You should definitely make some! I’m trying this tomorrow. Thank you for posting all these great recipes! Oh well, society has impressed an imperfect image of ratatouille upon us – I’m simply attempting to dispel myths! 😀 Thanks! I love how you have made this old time favorite of mine. I wish I would have learned from you how to make this dish. Thanks so much for your wonderful recipe. I will be using it the next time I make ratatouille. Thanks for such a great compliment – You’ll love this version, for sure. Such a compliment coming from you, Rosemary! Butter, excessive sometimes. Your blog is exceptional, also. 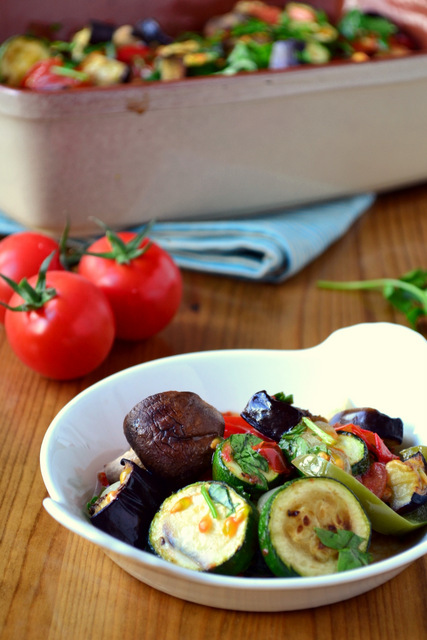 I’ve never had ratatouille before – which is a disgrace considering I love the Pixar film – but think it’ll make the round for my healthy-eats initiative. Thanks for the inspiration! Could you FedEx some of this to me in Boston, please? I don’t think we do FedEx here… or do we? I’m not sure. Either way… it would get messy. Looks great! I’ve just got the book; Mastering the Art of French Cooking, so will definitely try! Thanks so much 😀 – please do, you’ll love it. I love ratatouille, but like you, I like the veggies to look like veggies. This is a delightful and delicious looking recipe. I think it’s time to make ratatouiile again. 🙂 Love your pictures Frugal! Excellent! Exactly! It isn’t a sauce! Yes, Karista! 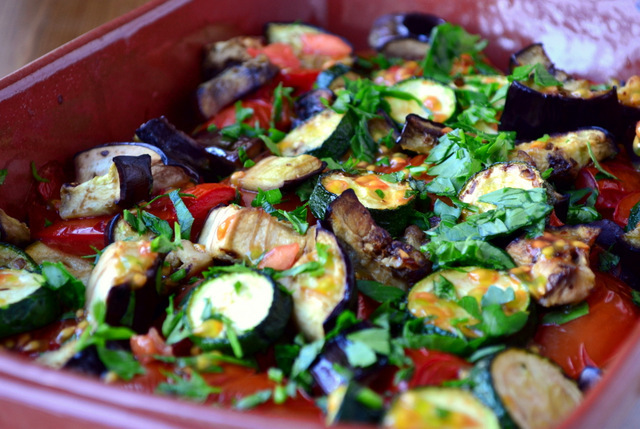 Get your ratatouille on! Good heavens! This is a delicious variation on my usually soggy version. Thanks. Haha – my sister said the same thing. Thanks 😀 – you too, BAM. I’m saving this one for next year when my veggie garden is full to the brim with delicious, organic vegetables. I’ve never made ratatouille, but do enjoy it. Thanks for the yummy looking photos and simple directions. That sounds like a great idea! You’ll definitely enjoy that! This turned out so lushly beautiful! It’s a dazzling dish of colors.. mine can sometimes end up grey and soggy, thank you for walking us through how to do this correctly! I think that’s probably acceptable :D. Thanks, Somer! I’ve never heard the word chuck though. Your blog is making me hungry!!! !